‘size does not matter ~ the size of runs does’ tweeted the Turbonator ! The man who does not exactly look in great shape or fitness, was in news yesterday is again in news albeit for different reasons. Head of International Cricket Council's anti-corruption unit (ACU) Alex Marshall confirmed on Monday that as many as five international captains have been approached for spot-fixing in the past one year. Four of them are from Full Member countries. Till date, only Pakistan captain Sarfraz Ahmed has publicly stated that an approach was made during Pakistan's tour of Sri Lanka in 2017. "There have been 32 investigations in the last 12 months, eight involve players as suspects. Five of them involve administrators or non-playing personnel. Three of these individuals have been charged. Five internationals captains have also reported receiving approaches to spot-fix," Marshall said at an media event at ICC's headquarters in Dubai. Before we read further, for those following Australian Cricket – Mick Malone may not be a household name. He played a solitary test and ten one dayers – after that breakthrough into Test cricket, he joined World Series Cricket and ended up playing only once for Australia at the end of their miserable 1977 England tour. He did open the attack in 2nd ODI, at Birmingham, Jun 4 1977 – when England were bundled out for 171 – yet won by 101 runs. Read a very interesting statistics today in ‘Ask Steve’ section in Cricinfo. This was condemned to be a dead-rubber ODI as the result will not change the fortune of both the teams – India has qualified – Afghan anyway knocked out – yet that would never take away the charm of Afghan innings. Mercurial MS Dhoni, having given up India's limited-overs captaincy in January 2017, was given the leadership once again because India rested Rohit Sharma among several other senior players. It then burst into life when Mohammad Shahzad - whose hero is Dhoni - smoked a record-equalling century to lead Afghanistan to 252 for 8. 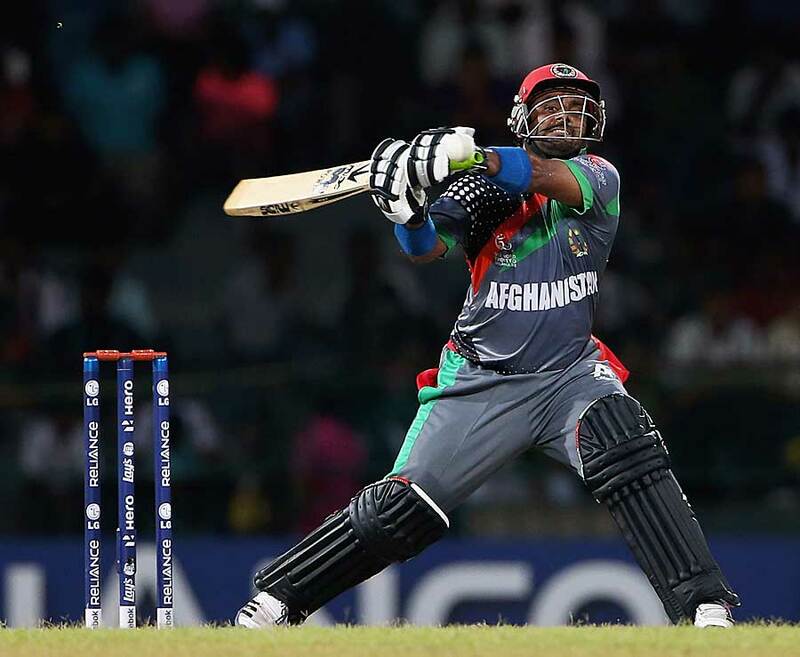 When Shahzad reached the landmark off his 88th ball with a gentle tickle to the fine-leg boundary - a shot that belied the ferocity of the innings - Afghanistan's score was 131 for 4. This was the joint lowest when a batsman had reached his hundred in ODIs since 2001. Deepak Lokandersingh Chahar made his debut for India in ODI. He was once rejected by Greg Chappell, who was director of the Rajasthan Cricket Association academy in 2008, Deepak Chahar roared back in style two years later. I had posted on his extraordinary feat earlier. At Sawai Mansingh stadium in Nov 2010 – Hyderabad were bowled out for a paltry 21… the score card read : 6;1;5;0;0;2;4;2;1;0;0 (Extras 0) – an inglorious end to a team which holds record for the highest innings total of 944/6 against Andhra…. Deepak Chahar made is debut – and the right hand pacer had a great spell that read 7.3-2-10-8. The previous Ranji record had been set in the first season (1934-35), when Southern Punjab were bowled out for 22 chasing 114 against Northern India in Amritsar. Chahar was on a hat-trick once, removing MP Arjun and Alfred Absolem with the last ball of his seventh over and the first of his eighth. Pagadala Naidu, the No. 11, kept the hat-trick ball out but got out to the next one. He was not close to getting a perfect 10, though: Pankaj Singh claimed the second and fourth Hyderabad wickets. Against England in Nov 1981, when Krish Srikkanth made his debut at Mumbai and was run out in uncharacteristic way, Kapil Dev and Madanlal shared it perfectly with 5 each in 2nd innings, leading India to win. In ‘Ask Steve’ in Cricinfo – the interesting Q was : Has there ever been an ODI in which two bowlers from the same side took five wickets? Steve Lynch answers that this too has happened once in ODIs – and the destroyers are most unlikely pair. Aussies had Jeff Thomson, Mick Malone, Max Henry Walker and Ray Bright – with 5th bowler quota to be filled by Greg Chappel and .. Gary Cosier. Chappell had figures of 11-5-20-5, while more gentle Gary Cosier had 8.5-3-18-5 !! ~ this is not such a rare feet in Test Cricket and has happened 52 times with Shahadat Hossain 5 for 71 and Shakib Al Hasan 5 for 62 for Bangladesh against India in Chittagong in 2009-10.